Most of you have seen at least one of the “Tron” films. 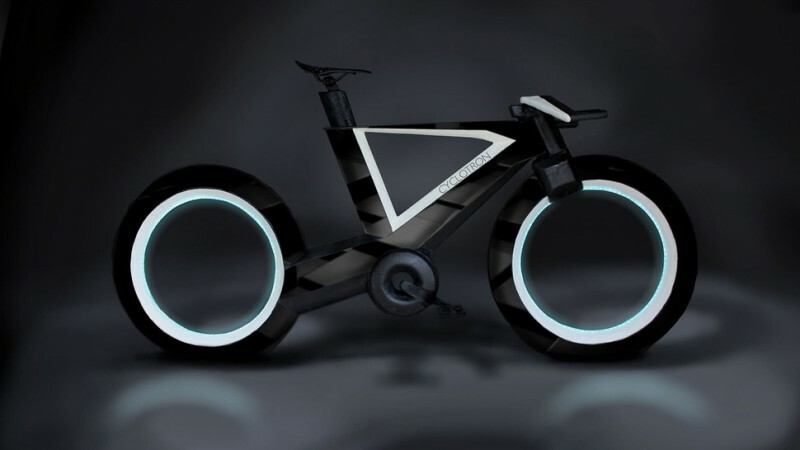 One of the most iconic features of that film was the Light Cycle — a futuristic, illuminated bike with spokeless wheels. This striking design has endured since “Tron’s” debut over three decades ago. 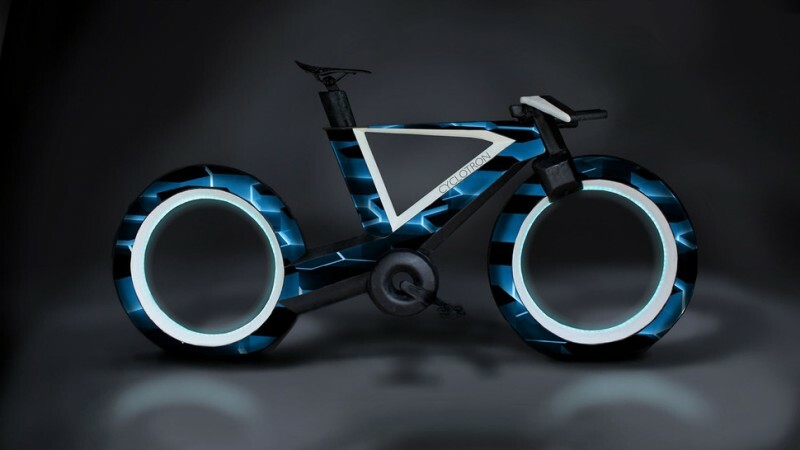 Everyone has looked at futuristic designs such as the Light Cycle and hoped that the future would produce incredible vehicles like it — and it’s come true: in the Cyclotron road bike created by Cyclotron Cycles. The Cyclotron is not a sports bike or motorcycle; this bike has three bases: one model has a base featuring a manual 12-speed, the middle model features an 18-Speed manual, and the top-of-the-line model offers an 18-Speed E-Gear (electronic gearbox). So, how can a 12-speed/e-bike look like this? The secret behind Cyclotron’s incredible design is that everything from the drivetrain, cabling, gears, brakes, and battery are integrated inside the Carbon Fiber frame. The bike only weighs only 26 lbs, which is impressive considering this groundbreaking design. 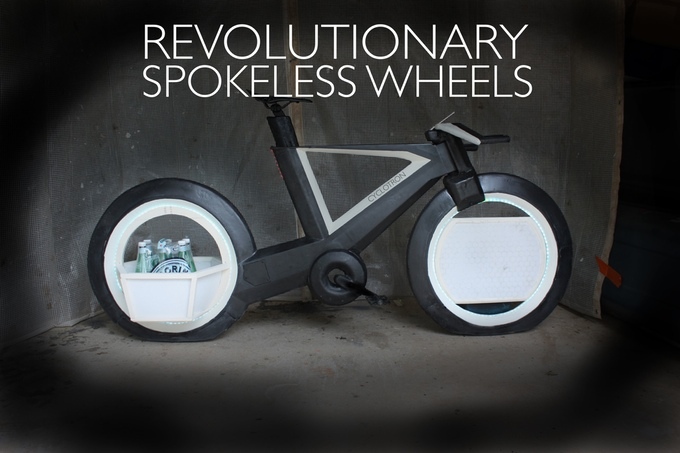 As for the illuminated, hubless wheels, these “tires” if you can call them that, have no spokes. The designers created what they call USMs (Utility Slot Modules), which are basically storage containers that are made to fit within the wheel where the spokes would normally sit in a traditional wheel. 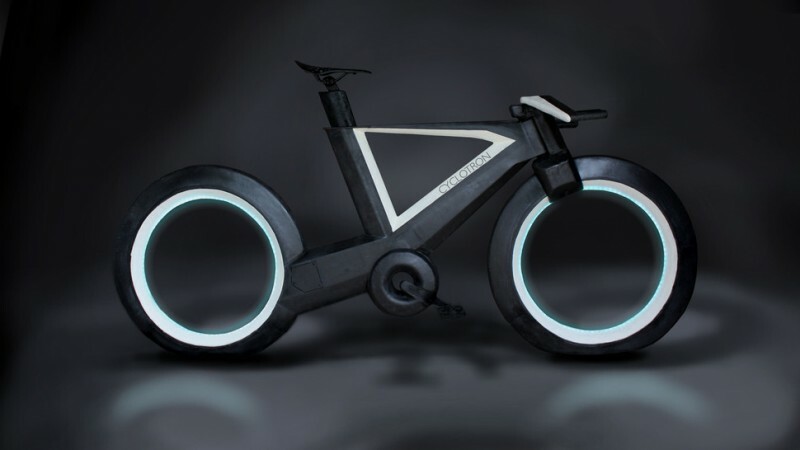 Using a gyroscopic effect, when you pedal and activate the electronic gearbox, the bike is propelled forward on a set of solid polymer tires that do not require any air. These tires are estimated by the manufacturer to last over 6,000 miles. Innovative Integrated Technology: Component Parts (besides pedals) are all integrated within the Carbon Fiber frame. Battery: Lithium Ion Battery Pack powers the Cyclotrons lights for more than 8 hours without engaging the internal dynamo. Cyclo-App notifies you when battery is low. 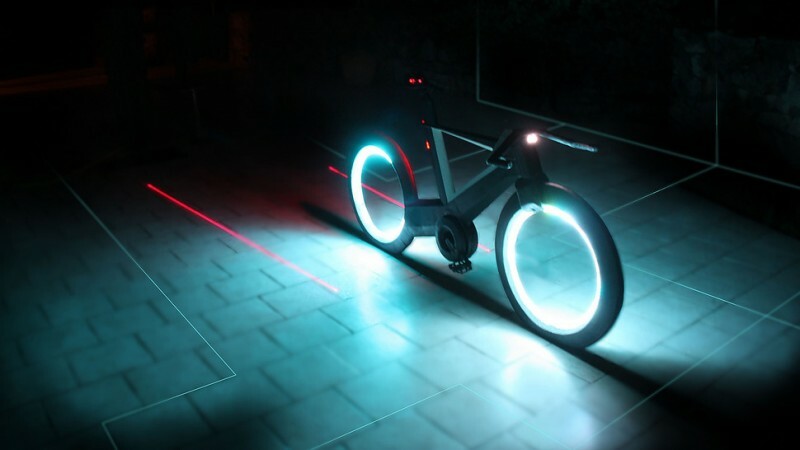 Tech Features: Illuminated Wheels, LED bike lane projector, Rear Red Light, Bluetooth LE-enabled Sensors, App Integration, GPS Integration, Anti-Theft Features, Autonomous Accident Reporting Service (Some of these require paid subscription). The frame is extremely impressive in the Cyclotron. Made of space grade Carbon Fiber composite material, the manufacturer combines two layers of carbon fiber with a core structure that is ultra lightweight. The result is using fewer layers of Carbon Fiber and less resin without impairing the stability of the bike. In fact, this Monocoque frame construction makes the bike rigid and stiff as well. The tube shapes of the frame are a combination of Ultralight Glider Planes with the edgy lines of Stealth Jets. While other bikes claim to offer full integration, they do not manage to integrate the chain or derailleur. The Cyclotron integrates everything from the Li-Ion battery, cables, wires, modified caliper brakes, the entire drivetrain, and hubless wheels. Only the saddle, handlebars, and pedals are exposed. In order to create and maintain the integrity of this bike’s aerodynamic and futuristic design, the Cyclotron’s drivetrain is integrated inside of the frame which is perfect for keeping out dirt but can be challenging when it is time to service your bike. All other component parts besides the pedals are also integrated within the frame. You can purchase a manual 12-Speed model or the top-of-the-line model that offers an intriguing electronic gearbox. If you wish to enjoy the ride, you can enable an automatic model where the e-gearbox will do all of the shifting for you in under a fifth of a second. The frame sizes are great with three different sizes that will accommodate riders from 4 feet 11 inches in height to over 6 feet 2 inches. The hubless wheels are illuminated from the interior, creating a spectacular look. These wheel halos turn on automatically in low-light conditions and are a great safety feature that increases your visibility to drivers. These lights can last for 8 hours on battery power alone. In addition, red laser lines can optionally project outwards from the rear, onto the roadway behind you to create a “bike lane” that is clearly defined. It’s uncertain how to wheels, which are mostly covered, will handle curbs and small obstacles with the solid polymer tires. This is also not intended to be a racing bike or used in competition. The Cyclotron is just an exceptionally cool, functioning road bike that can make your riding experience that much more enjoyable and fun. One of the most incredible aspects of this bike is the price. You would think that a bike like the Cyclotron would cost $10,000-plus, right? Nope. 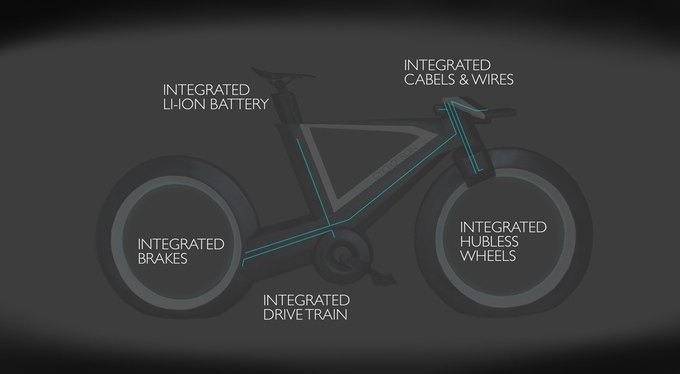 Those who were early in backing Cyclotron in their journey on Kickstarter have their bikes reserved for around $1,000. However, since funding was so great (Cyclotron has been developing this bike since 2012 and long-eclipsed its funding goal), the price for the public is as little as $1,300. Even for the manual, 12-Speed model, this sounds almost too amazing to be real. 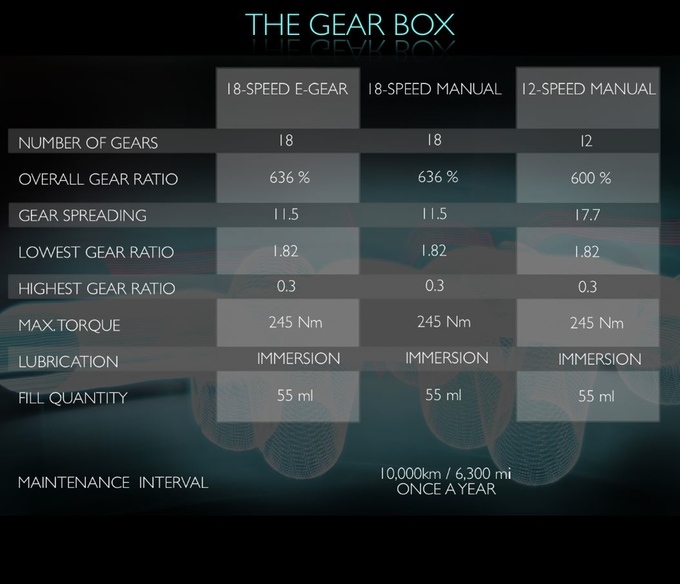 The model with the high tech electronic gearbox should not be that much more expensive. Regardless, the fact that this bike of many people’s dreams will only set you back a couple of thousand dollars at the most is the best news to hit the cycling world since the release of the Diamondback Andean.